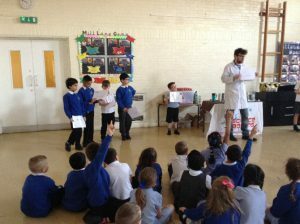 At Mill Lane Primary we focus on engaging all children in a broad range of scientific activities; enabling each and every child to develop their knowledge and understanding of key science topics and to improve their scientific skills. To be inclusive, we ensure the activities are as practical and interactive as possible; tailored to the age and stage of development of the children. Science at Mill Lane encourages the children to ask questions, enquire, plan and carry out investigations. As part of such investigations, the children make predictions, observe what is happening, record and interpret their data. They are also introduced to, and carry out, ‘fair tests’. Science is taught as a discrete subject but is made more prominent by being delivered in a cross-curricular way as part of a half termly topic; making the learning more meaningful and engaging for the children. In line with the National Curriculum expectations, the children cover a range of scientific areas. Within Early Years Foundation Stage the children are beginning to explore the world and their surroundings through activities such as gardening, making houses for animals, experimenting with materials, and exploring water. By Key Stage 1, the children are engaged in the following topics: Plants, Animals including humans, Everyday Materials, Seasonal Changes, Living Things and their Habitats. At Key Stage 2 children look in greater depth at the following topics; Living Things and their Habitats, Animals including humans, and Plants. They also explore Rocks, Light, Forces and Magnets, States of Matter, Sound, Electricity, Earth and Space, Changes in States of Matter, Forces, Evolution and Inheritance. Throughout Key Stage 2 the children are taught through Collins Snap Science, which provides many hands-on, engaging experiences for every child. 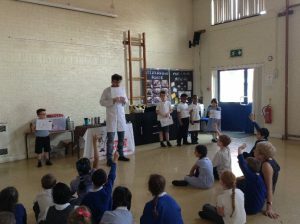 To engage the children and encourage them to enjoy Science, Mill Lane was very lucky on Tuesday 8th May to have a visitor from Science Boffins in. 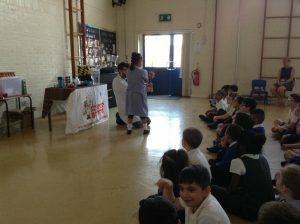 We all had a lovely whole-school assembly, where the children got to experience some exciting scientific experiments. Some classes then had a Superhero workshop where they found out about renewable and non-renewable sources of energy. We learned about the importance of using renewable sources of energy wherever possible. The children were shown how to make a simple water filter as a way to ensure we had safe, clean drinking water.